We’d love your help. Let us know what’s wrong with this preview of Find Me by Francesca Riley. When Skye Sebastian returns to the seaside village of her childhood and meets Hunter, a compelling, mysterious swimmer, she is soon drawn out of her depth and swept into a dangerous riptide. Instead of seekin What if the boy you love is immortal, ocean-bound, and you are a human girl afraid of the sea? This book draws you in right from the start. As you journey along with Skye you really want to find out all the secrets about the mysterious Hunter and if that can be together. It's a perfect blend of fantasy and subtle romance. The ending is satisfying and yet leaves you wanting more. Perfect for fans of The Watersong Series and Twilight. Such a good read! You just get totally pulled in and can't stop reading! It really takes you into its own world - I just love these kinds of books that create their own intense reality and pull you into the story. Skye and Hunter are such great characters and Sky is really relatable and likeable. I highly recommend this book! Amazing, couldn't put it down! A real page turner! If you are a Twilight or Mortal Instruments fan you will love this! Mysterious and suspenseful, full of danger and romance. I love Skye, she's real, she's the kind of heroine you can relate to and the story hooked me in from the beginning. This book is the perfect read. Can't wait for the next one!! Skye is afraid of the ocean but decides to go back to the Island where she spent her early childhood. She is forced to confront her fears almost as soon as she leaves the main land. I enjoyed Find Me. The story was unexpected. I really thought the underlying myth was going to be different than what it turned out to be and I'd say it was pretty unique. 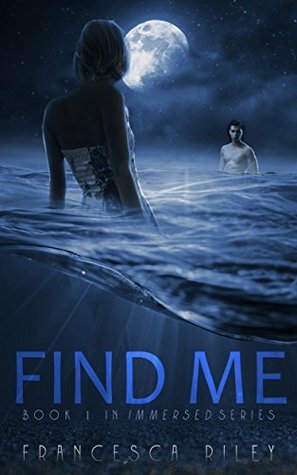 Find Me has an absorbing plot with just enough suspense to make you keep turning pages. I honestly think the author could have ended it as it stand Skye is afraid of the ocean but decides to go back to the Island where she spent her early childhood. She is forced to confront her fears almost as soon as she leaves the main land. I honestly think the author could have ended it as it stands in book 1, but apparently there will be a book 2 released. I'm pretty curious where the story will go from here.